Yesterday I went to see Mojo with a friend in London. It was a great day out as the friend I saw it with I hadn’t seen since September so it was a great to have a catch up and go see a play with a great cast that we both ended up really enjoying. Mojo is set in a Soho bar and club in the 1950’s and it all takes place across two days. One night Silver Johnny (Tom Rhys Harries) is with the club’s boss Ezra talking to Sam Ross who comes across a bit of a gangster (or at least all the other character’s react to him as if he is). The next morning Ezra is dead, Silver Johnny is missing and the clubs staff Mickey (Brendan Coyle) Ezra’s second-in-command, Baby (Ben Whishaw) Ezra’s son who is clearly at least a bit crazy, Skinny (Colin Morgan) who’s slightly dim-witted and always manages to rub Baby up the wrong way, and the double act of Sweets (Rupert Grint) and Potts (Daniel Mays) are struggling to figure out what to do and if or when Ross is going to come and murder them all. The whole cast is brilliant and they work great together. It may be Grint’s first time on stage but he most definitely holds his own with the rest of the cast. Whishaw was fascinating to watch as he bounced from being distant to crazy to reckless joker – whenever he sang it was slightly unnerving. Daniel Mays was amazing to watch and was probably both my favourite character and performance. I did hear comments both in the interval and when the play was over that some people just didn’t understand what was going on so didn’t really like it that much. I think this may be because both Ezra and Ross are characters offstage and we as the audience only get the information that progresses the plot verbally via the characters and, as the dialogue is so quick and witty, it’s possible that some people may have missed that information. Both me and my friend had no problem following and understanding what was happening – this could have been because we are both English and Film graduates so are used to stories that don’t always spell everything out for you or it could just be that the people around us weren’t paying as much attention. Who knows?! Mojo is funny and it’s of the black comedy variety – which increasingly seems to be my favourite type of comedy. The banter between the characters is great, especially between Potts and Sweets. Mojo is as rude as it is funny as well as being violent and shocking. It’s all a crazy mix and it works out great. To be honest part of the reason we chose to see this play was because we liked the actors involved but in the end I liked the story just as much, if not more. I thoroughly enjoyed Mojo and would definitely see the members of the casts in future stage productions as they were all fantastic. 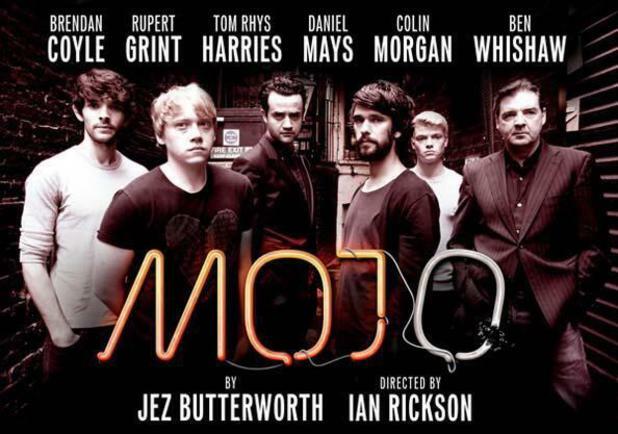 For more information about Mojo and tickets go HERE – the show ends February 8th 2014.